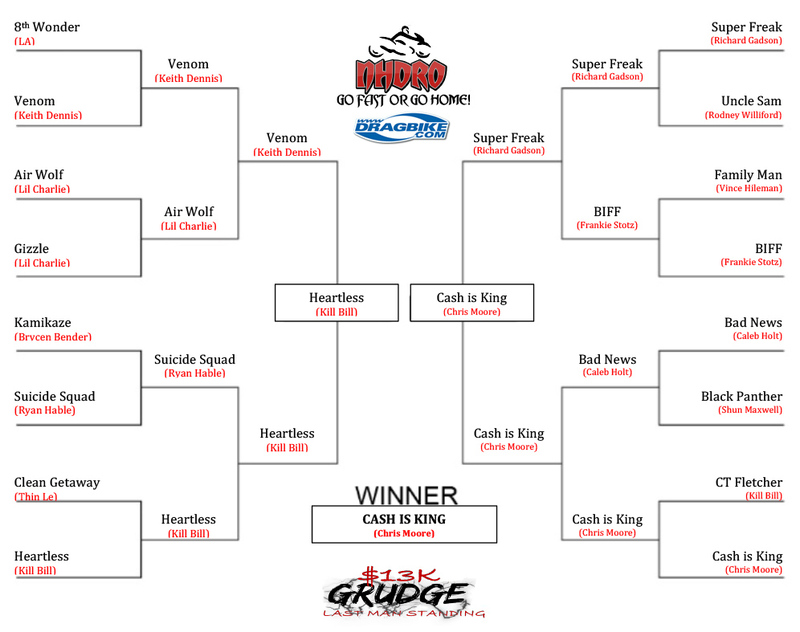 “Cash is King” but a check will work too, especially when it’s an NHDRO “Big Check” for $13,000. 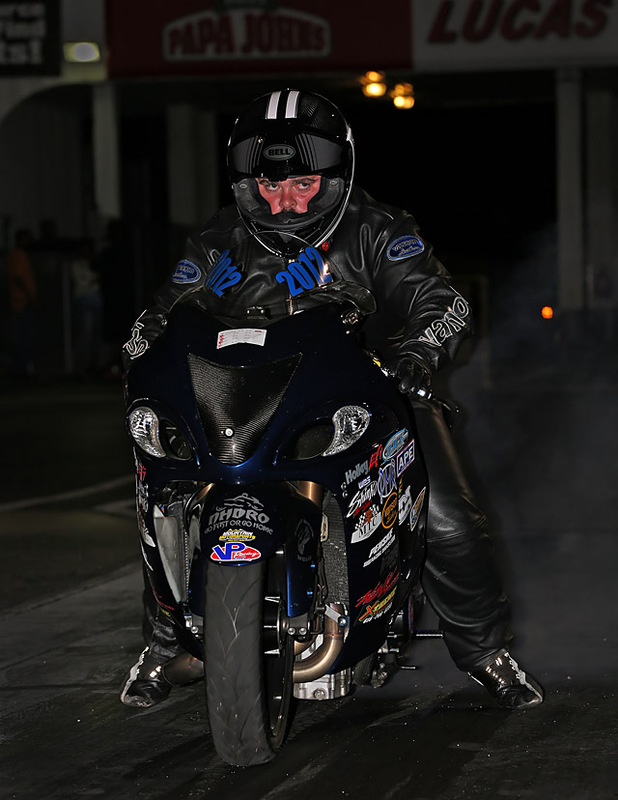 That’s what Chris Moore earned for winning NHDRO’s Last Man Standing Grudge Spectacular Saturday night at Atlanta Dragway in Commerce, Georgia. 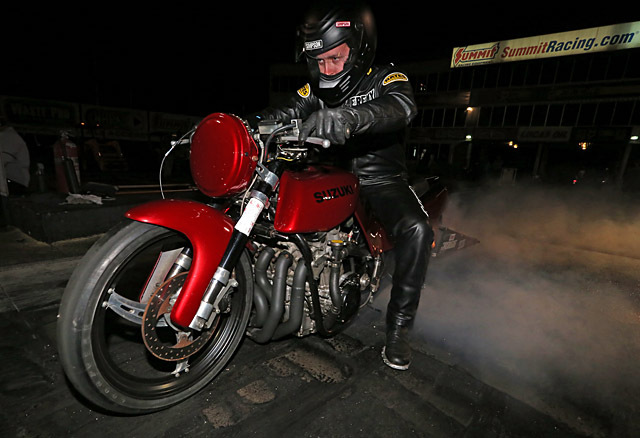 It was the crowning moment of the 190hookup.com Season Opener—the first race of 2018 for America’s fastest growing motorcycle drag racing series. 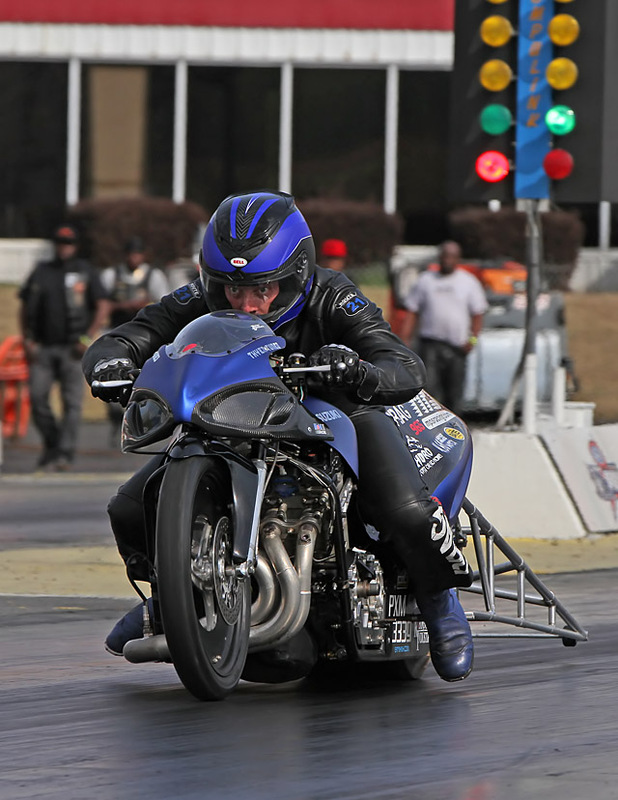 “That was my first time going to an NHDRO race and I really enjoyed it,” said Moore. 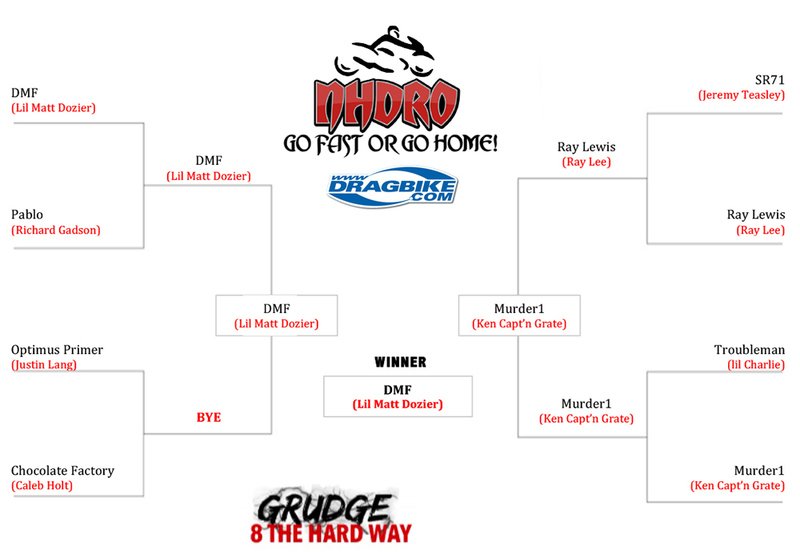 “I like the way Brian (NHDRO owner Brain Welch) put the race on. Like when the track wasn’t hooking, he talked to the track staff about it.” Needless to say, the track was put into good shape and Moore was impressed. 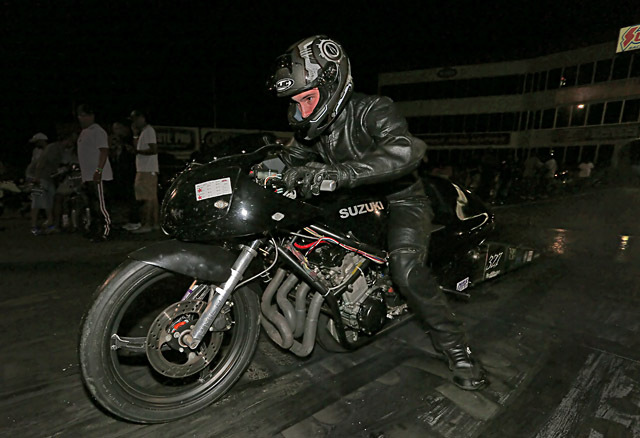 “I said ‘This guy (Welch) is legit.’ I’m hoping he’ll put one of these grudge races on at Indy, ‘cause I’ve never raced there and I really want to.” NHDRO races at Lucas Oil Raceway in Indianapolis in August and September. One of the highlights of the Last Man Standing was the reunion of rider Keith “Shine” Dennis and builder/tuner Joe Marasco of MSP—a legendary duo that broke up some thirteen years ago. 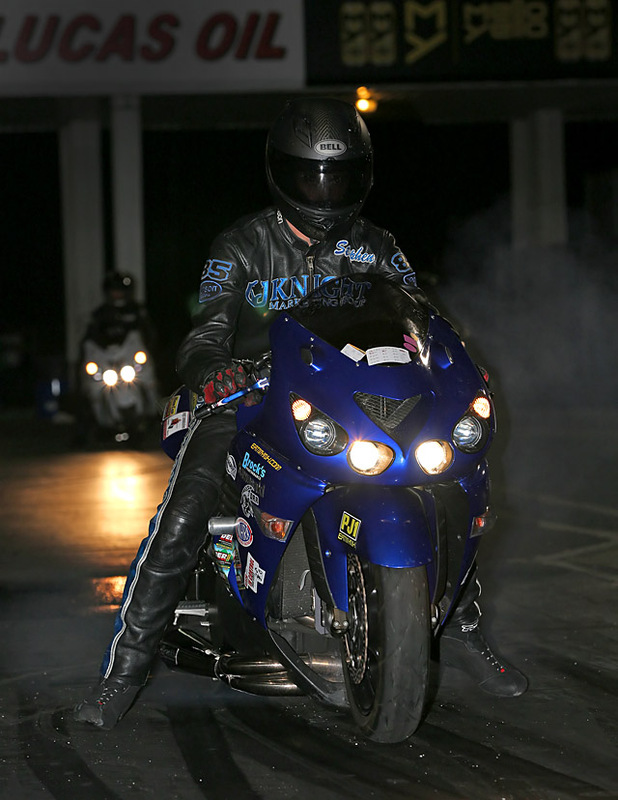 And they had a good run on Saturday, racing the “Venom” Suzuki GSXR1000 past rider “LA” on “8th Wonder” in round one and Lavar “Lil’ Charlie” DeLee on “Airwolf” in round two before getting outrun by the “Heartless” Kawasaki ZX14 in the semi. Dennis spent time between rounds entertaining the crowd with his fast-talking, agile, and razor-sharp wit. 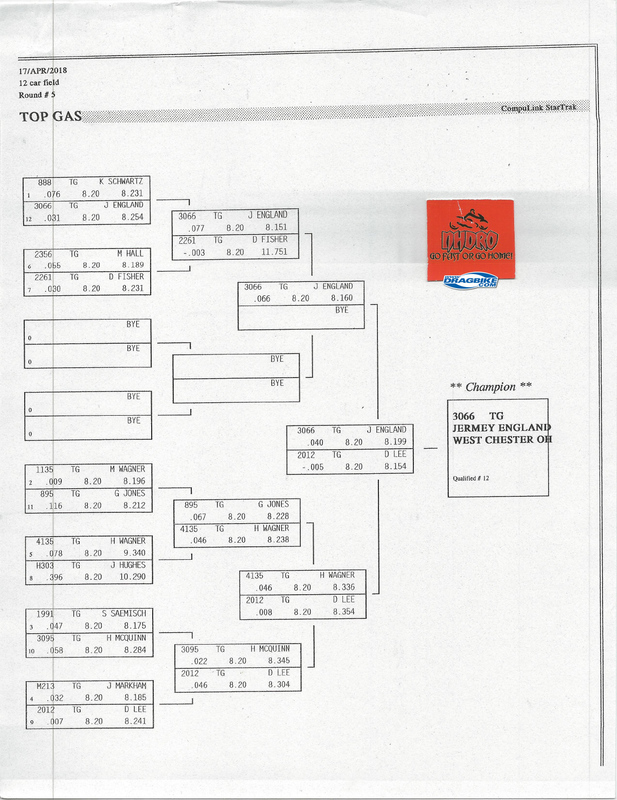 One of Jeremy England’s two wins came in Top Gas 8.20 index when Dustin “Biscuits” Lee redlit by -.005. Number one qualifier Kounselor Kenny Schwartz lost to England in round one. 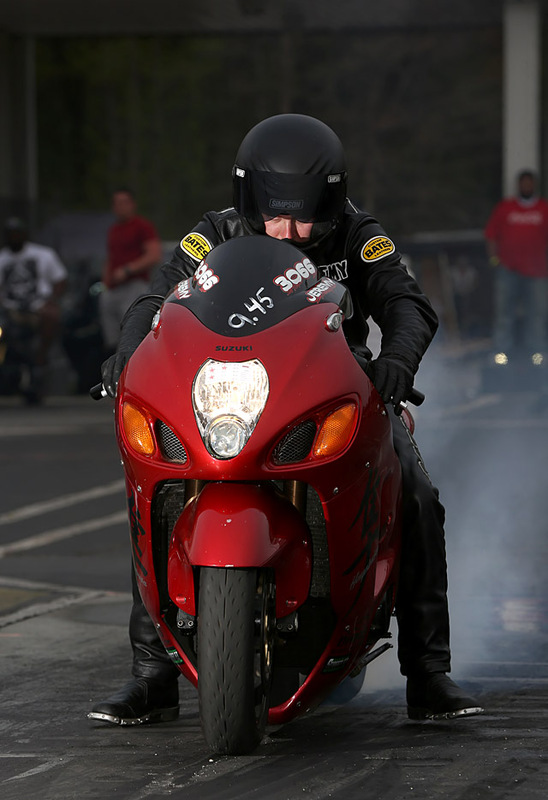 England rode his dragbike in Top Gas, but his streetbike in Penske Racing Shocks Street Fighter—where he won the final against Vince “Family Man” Hileman, who broke out. England beat number one qualifier John “Spooky” Markham in round two. 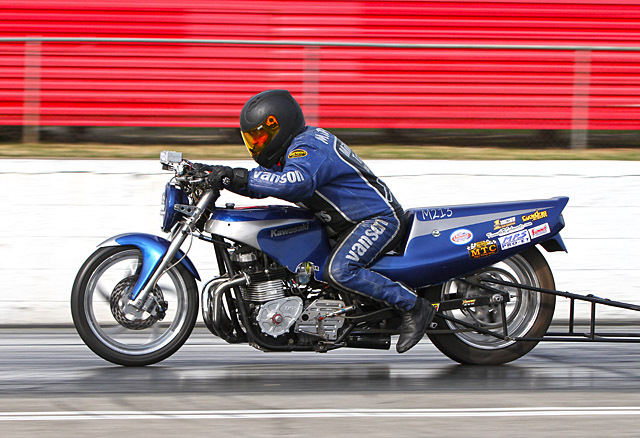 Markham spun a rod bearing in his own championship-winning Street Fighter bike, so he borrowed a bike from Stanley Russell—a man whose heart is as big as his appetite. 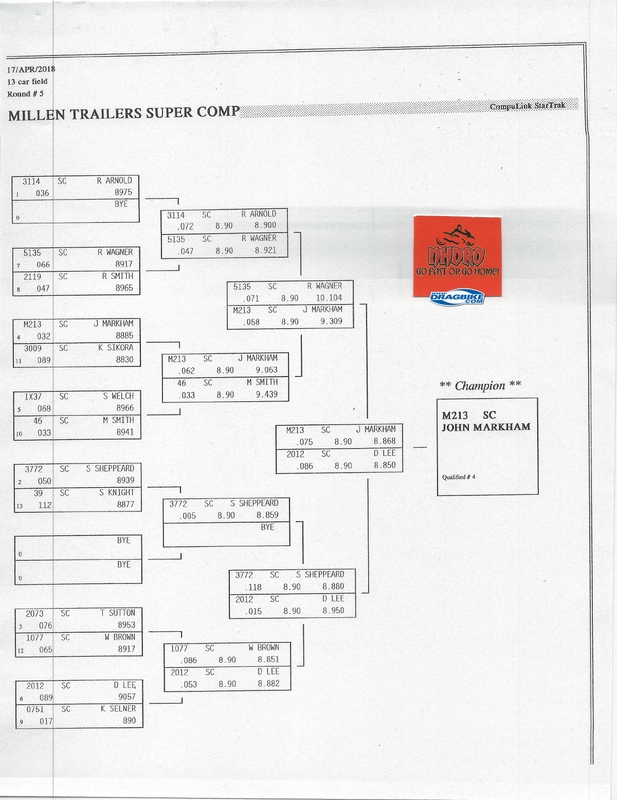 But in Millennium Trailers Super Comp, Markham was on his own tried and true dragbike and took the double breakout final over Dustin Lee. 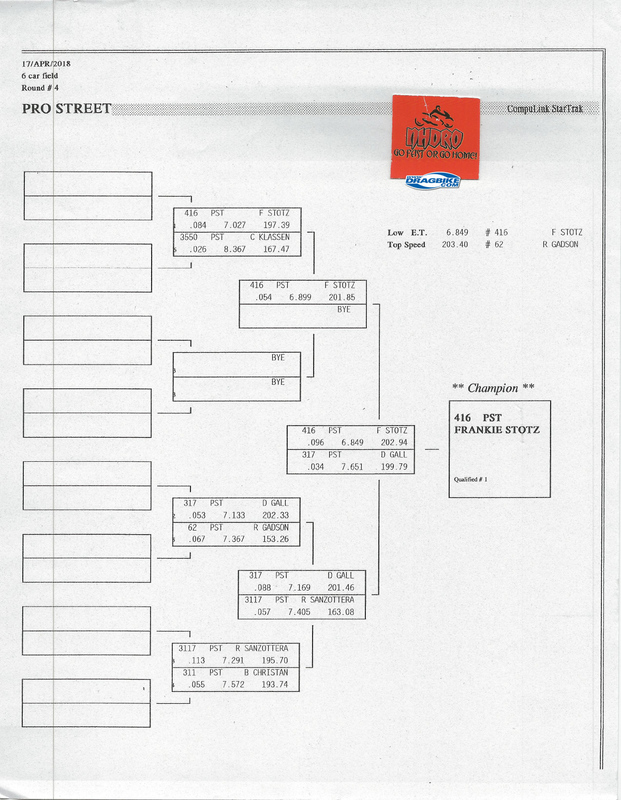 Number one qualifier Ron “Ju-Jitsu” Arnold lost to Rachel Wagner in round two. 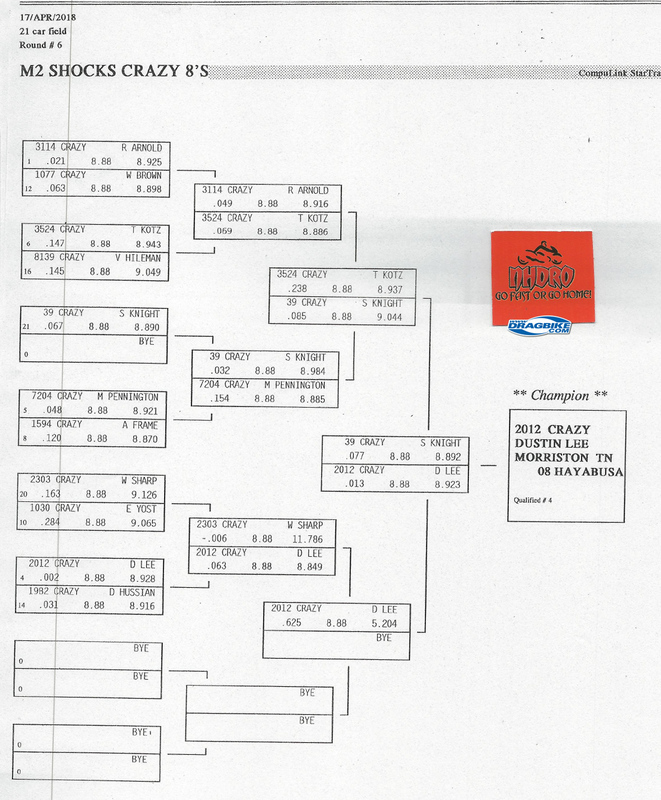 Don’t feel too bad about Lee losing the Top Gas and Super Comp finals, as he took the win in M2.Shocks Crazy 8s. 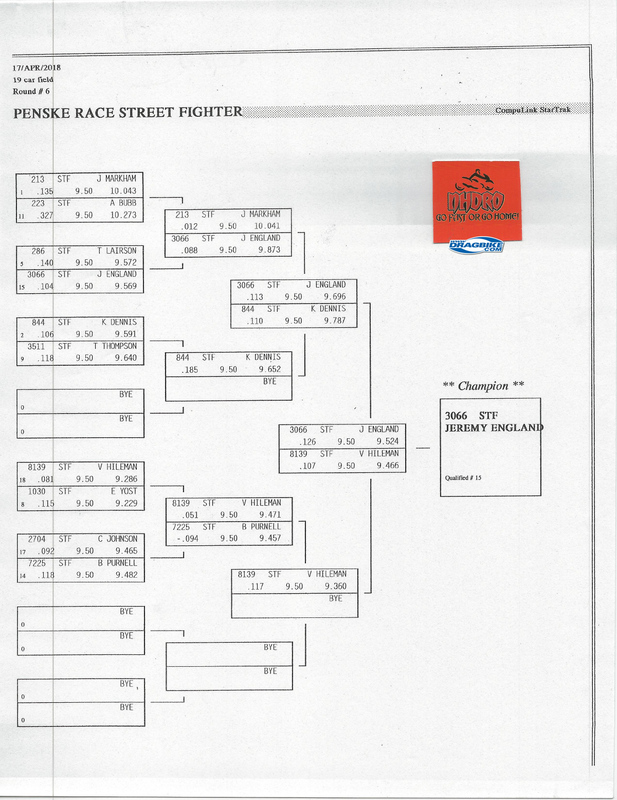 Lee beat Stephen “The Right” Knight with an .013 light to Knight’s .077. 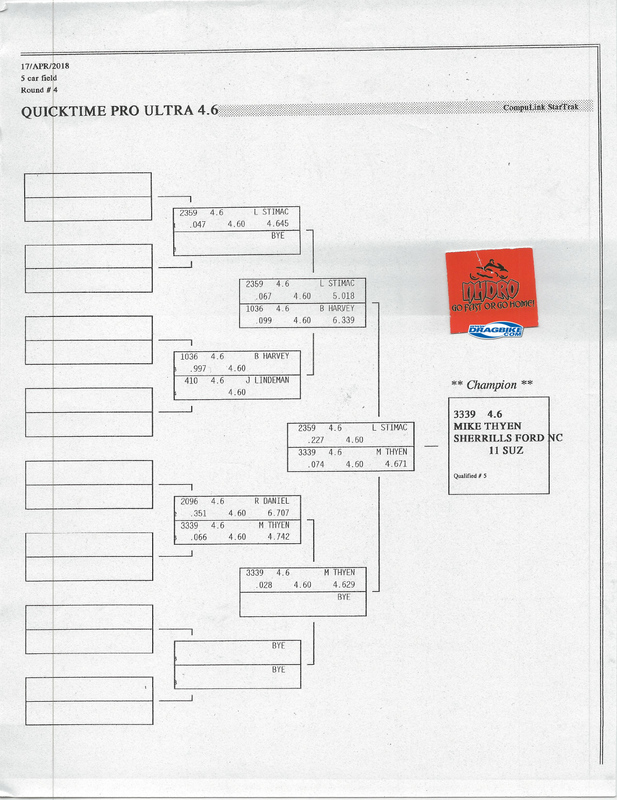 Ron Arnold also qualified number one in Crazy 8s, and also lost in round two—this time to Travis Klotz. 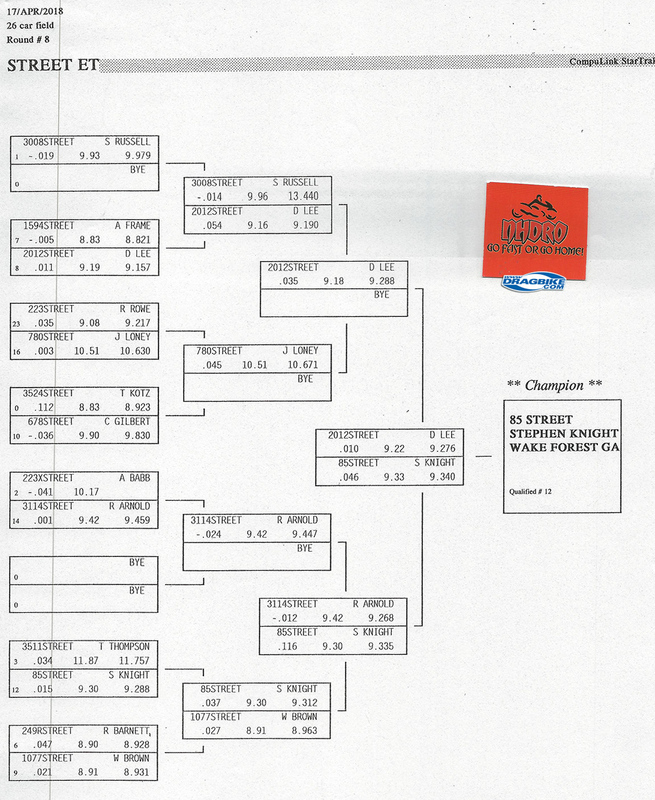 Don’t grieve too hard for Knight either, as he won Kevin Dennis Insurance Street ET. He won the final despite leaving .036 later than Lee—Dustin’s third runner-up of the night. 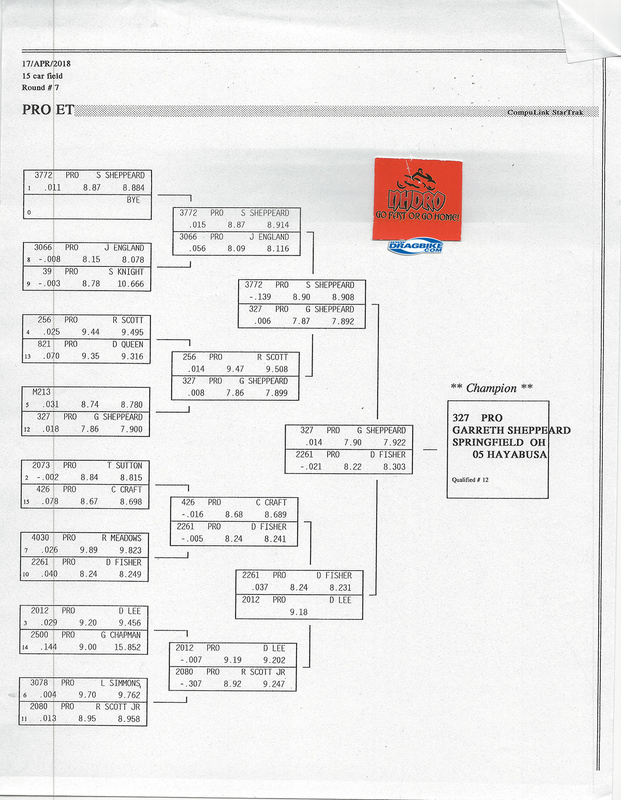 Garreth Sheppeard won MPS Pro ET, beating veteran racer Doug Fisher—who redlit—in the final. 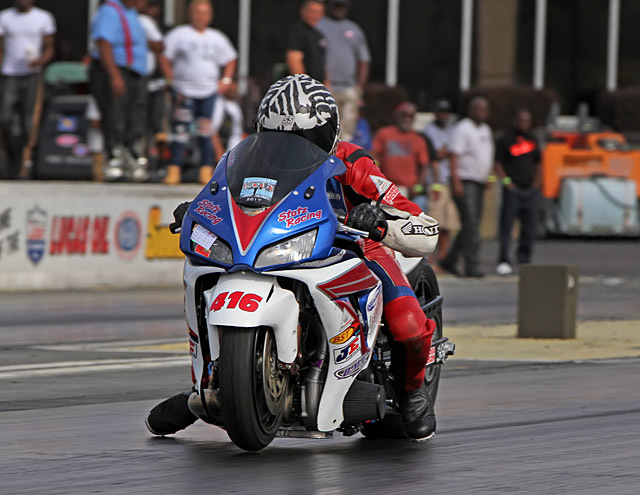 Dorian ‘Doe Doe’ Wallace won NHDRO’s first Grom race, sponsored by Total Racing Motorsports, and Anthony “Bishop” Randle won the Heavy Hitters race. 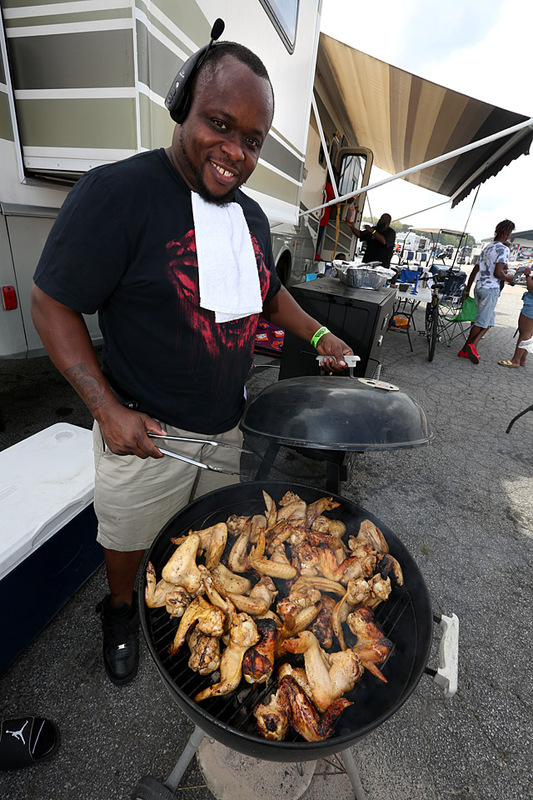 And because NHDRO events satisfy all your senses, grillmaster Sherman Matthews won the turkey smoking contest. 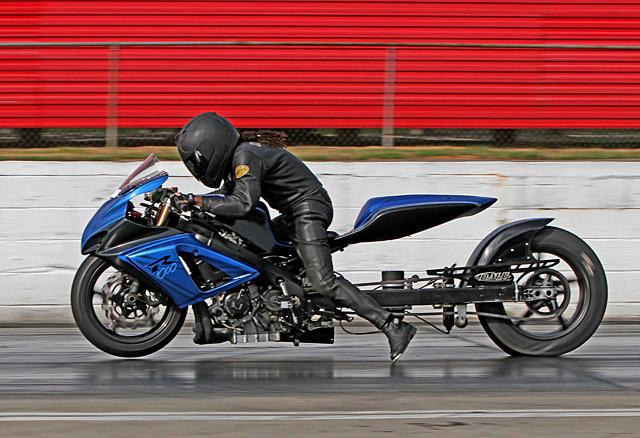 The next reunion of the NHDRO family is back in the Midwest at Dragway 42 in West Salem, Ohio for the Liguori Drag Racing May Bike Fest on May 4-6.